I love meals that feel hearty without being overly complicated or have too many ingredients. There are times that I’ll shy away from a recipe if I glance at it and the list of ingredients and steps to produce seem like the recipes is complicated (a bad habit because I’ve skipped recipes before that someone was just needlessly wordy.) I can assure you, these garlic sweet potatoes are fast and really quite simple. The recipe only has four main ingredients (with a sprinkle of parsley for five) and comes together for a rather quick breakfast. 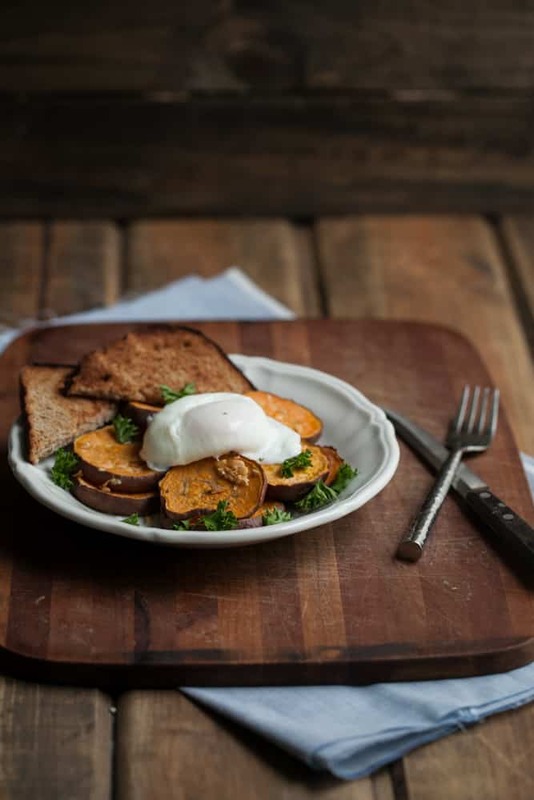 An easy fall/winter breakfast with minimal ingredients. Use your favorite type of egg preparation method. 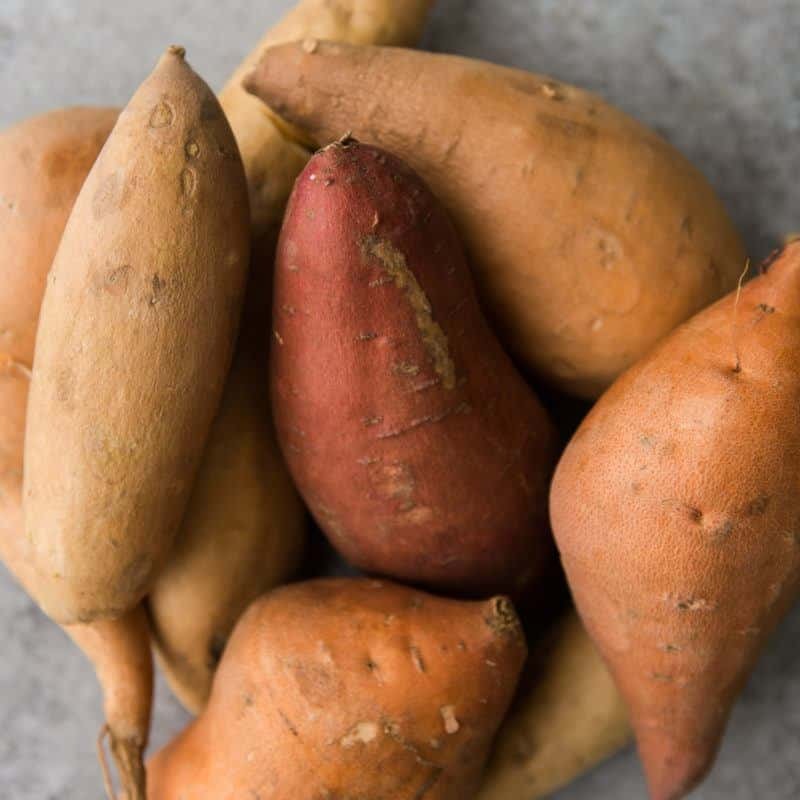 Scrub sweet potato and cut into 1/4″ slices. Mince garlic and toss with sliced sweet potatoes and olive oil. Place in parchment with enough edge room to fold over and cover sweet potatoes and place seam side down. Roast for 20-25 minutes. While sweet potatoes are cooking, bring a pot of water to an almost-simmer (bubble should be forming around the edges, but there should be very little motion in the pot. Crack an egg into a bowl and carefully pour it into the hot water. Let cook for 3-4 minutes until egg whites are set. Remove and continue with second egg. Tips and Tricks: I am a big fan of crispy bits and the garlic does get a bit crispy here (it doesn’t burn). However, for another option you can roast sweet potatoes without the garlic and while the sweet potatoes are roasting, cook some garlic in some olive oil over medium-low heat for 1-2 minutes and toss with sweet potatoes when done. Salad: Turn this into a salad. 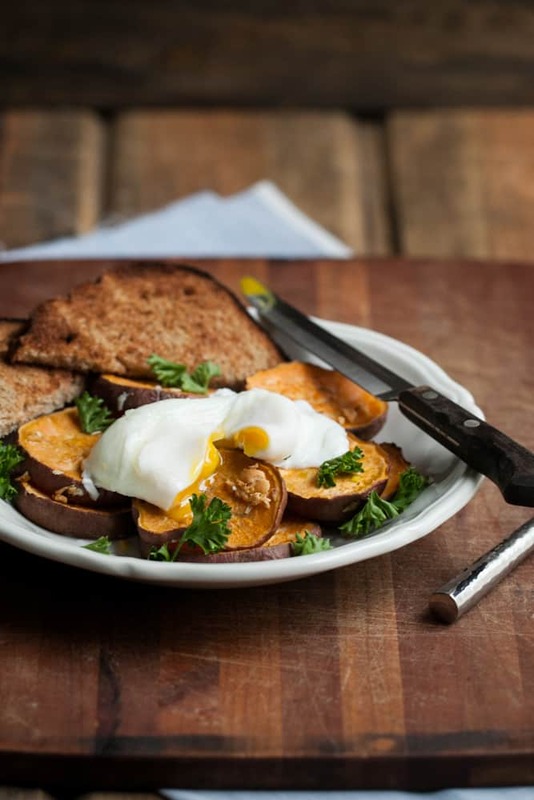 Toss the garlic sweet potatoes with greens, hard boiled eggs, and a simple mustard dressing. Vegetables: Roast regular potatoes, winter squash (delicata would be lovely), or a mix of root vegetables. Vegan: Use a tofu scramble! Sweet potatoes are great for achieving that hearty taste without the heavy feeling. Good call! What an amazing dinner! I am going to have to make this soon! So quick and fabulous. Slap an egg on it and it’s dinner! Yes please. I’d eat just about anything if there’s a poached egg on it. Simple cooking with no fuss and not much mess is my mantra! This sounds fabulous. You definitely had me at sweet potatoes. There are so many lovely things that can be done with them, including this! I’ve been craving vegetables at breakfast like crazy lately, so this post is rather fortuitous. 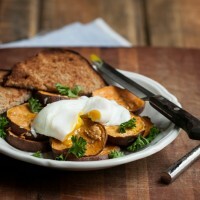 So excited for roasty sweet potatoes and poached eggs! I’ll probably throw a little avocado and smoked salt into the mix for craziness. Also glad I’m not the only crazy person that leaves the sweet potato’s peel on. 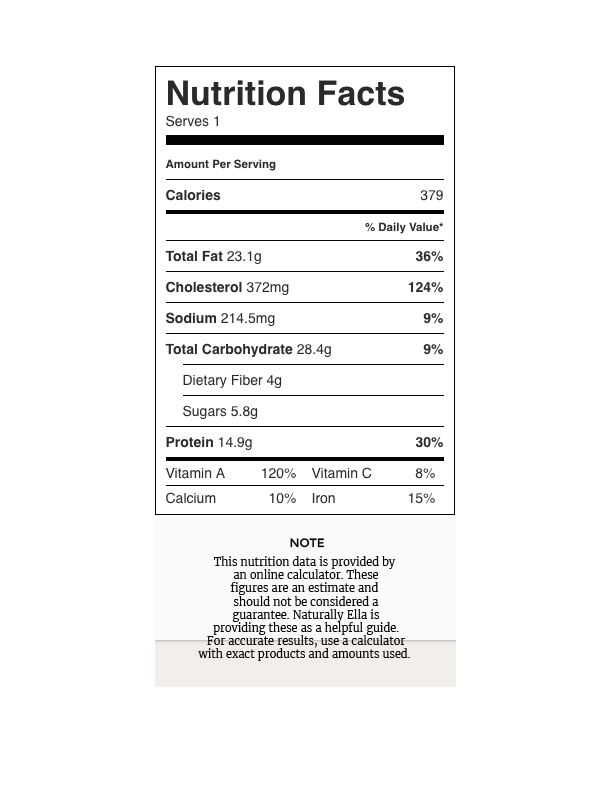 There’s so many nutrients there! I love a hearty and quick morning meal that doesn’t mean oatmeal! I make something similar, but use carrots, parsnips and kale, so good! Just found your blog yesterday and tried this recipe for breakfast. I’m still mastering the art of poaching an egg, but my husband and I both really enjoyed this simple, nutritious breakfast. Thank you for sharing! Wow, I just made this and am devouring it as I type this! What amazing flavor combinations.